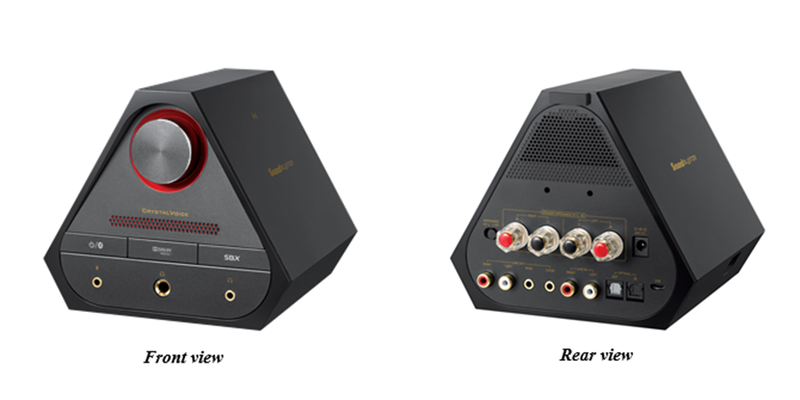 Creative Labs announces Sound Blaster X7 – the biggest, baddest sound blaster yet. Creative Technology today announced the Sound Blaster X7, their most powerful and technologically advanced audio solution for gamers (or anyone else really) to date. No matter what you listen to and what platform you play it through, the X7 promises to make it bigger, louder, and better. The X7 uses Creative’s impressive audio processing technologies and turns them all up to “11” with audiophile-grade components and specifications. The X7 aims to meet the needs of virtually every type of user on virtually any platform, including PC, console, smartphone, tablets, TVs, and more. The Sound Blaster X7 is basically an ultra high-end external USB Sound Blaster with nearly every form of connector all crammed into a small trapezoid. And you know it must be something special when the press release is no less than 7 pages of specifications, options, and (of course) the usual marketing hyperbole–and an MSRP of $399. Wong Hoo Sim, CEO of Creative. The Creative Sound Blaster X7, priced at USD399.99, will be available in December 2014 at the online store at creative.com.